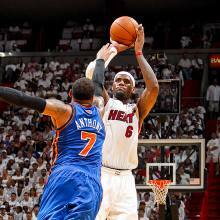 AGAINST the No.2 seed in the Eastern Conference, the No.7 seed New York Knicks were given a puncher's chance to topple the mighty Miami Heat when the 2012 NBA playoffs unreeled Saturday afternoon. Instead, the high-flying Heat turned the hapless Knicks into a punching bag as Miami coasted to a 100-67 victory at the American Airlines Arena in Miami. The lopsided walloping gave the Heat a 1-0 lead in their best-of-7 series. LeBron James was the biggest bully them all, tormenting the Knicks with 32 points on 10-of-14 shooting plus 11-of-14 free throws. The 6-foot-9, 250-pound leading MVP candidate also had four rebounds, four steals and three assists in a spectacular show of versatility. "LeBron really led the way, obviously attacking, getting to the free throw line. He was on the back line of our defense, like a free safety, reading the offense in front of us," said Miami head coack Erik Spoelstra. The game was competitve midway through the second quarter as the Knicks trailed only by a point, 29-30, with 6:32 to play before the halftime break. But Miami went on a killer run and built a 54-31 lead. The Heat eventually led by as many as 37 points. "They hit us in the mouth so we've got to see what we're made of now," said Knicks head coach Mike Woodson whose team was held to just 25-of-70 field goals (35.7 percent) and 7-of-21 from 3-point range (33.3 percent). Miami made 34 of its 70 shots (48.6 percent) as well as eight of its 21 treys (38.1 percent). And the Heat made a beeline to the free line, going there 33 times and making 24. In contrast, the Knicks only had 11 freebie attempts and converted 10. Showing little signs of a dislocated finger injury, Heat guard Dwyane Wade had 19 points while Chris Bosh, the third wheel of the Heat's Big 3, had a quiet nine points and six rebounds. Mario Chalmers orchestrated the Heat offense wonderfully, scoring 11 points and dishing out nine assists. J.R. Smith led the Knicks with 17 points but Carmelo Anthony struggled immensely against the Heat defense, scoring just 11 points on 3-of-15 shooting from the field. Amare Stoudemire finished with nine points and five rebounds.